Mogadishu (HAN) April 24, 2014 – Somali farmers are not able to engage in farming due to the Conflict in Baidoa, But It was double joy for the farmers in Baidoa after the much anticipated long rains started pouring this week prompting the farmers to hurriedly plough and plant their fields with an unexpected help from AMISOM peacekeepers from Ethiopia. The forces volunteered to help them with the tedious work of tilling the land, planting maize, sorghum and sesame seeds. While in Mogadishu, the Somali Prime Minister Abdiweli Sheikh Ahmed, closed the National Security Conference held in Mogadishu, telling attendees that “local communities and the security forces must have a close relationship – we are one people with one enemy”. The National Security Conference organised by the Ministry of National Security brought together representatives from all regions of Somalia, senior commanders of military and security forces and the international community over four days with the aim of strengthening the security agencies of the government. The peacekeepers took part in the community work organized by Civil and Military Cooperation (CIMIC) unit of AMISOM to boost relations with the locals and also to set an example to the people of Baidoa that unity is strength and foster a sense of caring for the weaker members of the society. AMISOM peacekeepers in Baidoa also gave free drinking water and offered free healthcare to the locals living within the environs of its bases. 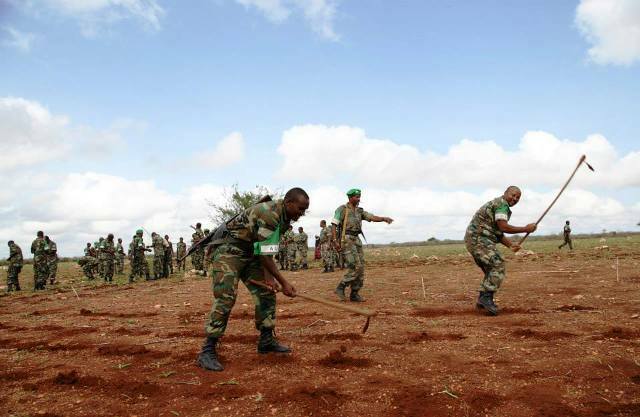 The women and elderly who benefited from the rare benevolence from the Ethiopian peacekeepers were elated and grateful saying that it would have taken them nearly a month to till the land and plant the seedlings if it were not for AMISOM help. Sector 3 CIMIC Officer Col. Gebrahawari Fitiwi said AMISOM had decided to help the members of the society as an exemplary gesture and to inspire the Somali population as well as encourage productivity among locals. “Since it is the raining season in this area, AMISOM is helping disabled persons, the elderly and women to plant their farms. We are committed to taking part in such activities for the community and that is why we are helping. There are some positive changes in this area because the security is improving. As peacekeepers here it is in our plans to continue with such activities of helping the community and implementing quick impact projects in future,” Col. Gabrahaware said. The regional zone of Baidoa is a rich agricultural city located 240 west of the Somalia capital Mogadishu. During the era of peace in Somalia, Bay region was the sorghum basket in Somalia. It was famous for its cool environment and plenty of pasture and milk, attracting the nickname Baydhaba janay or paradise Baidoa. Due to insecurity and persistent drought in recent years, farmers in Bay and Bakool regions have had contend with low harvest coupled with “double taxation” from Al-Shabaab militants resulting in many farmers fleeing their farms and to live in poverty and squalor as internally displaced persons due to the Al-Shabaab menace. AMISOM support came as a relief to some of the farmers who are “expressed appreciation to AMISOM gesture of kindness”. “It would have taken me and my children three months to plough our farm and at least one month to plant it and so we are really grateful to AMISOM forces for helping us plant our farm,” 40 year old mother of 7 children Sontay Muhumed said. For some, like 60 year old Gedi Abdi, the move by AMISOM left him almost speechless. “This is the first time for AMISOM forces to undertake such a huge activity that has made us so proud and happy because they really helped us today and we hope they will always continue to help us,” Gedi said.